Completion-type maps that cost charisma. Getting 3-stars will give you 1 sacred crystal once. Getting all three drops will give you a silver unit once. Farm-type maps that are available on certain days of the week. Getting 3-stars will give you 1 sacred crystal once. Map-type wholly dependent on the current event. See the event info post for details if applicable. Events generally last one week, but there are 2-week events that have a first and second phase. Map-type dependant on the current event. See the event info post for details if applicable. Basic Points: Maps are cleared either by running out of life, or vanquishing the entire enemy army. Rewards are based on the total number of subjugated enemies in multiple sessions, and one-time rewards for subjugating a certain number of enemies in a single session. Tutorial maps that cost stamina. Getting 3-stars will give you 1 unit once. 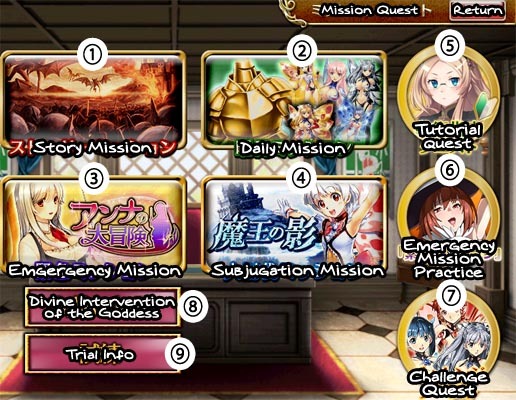 Former emergency mission maps that cost stamina. Getting 3-stars will give you 1 unit once. Farm-type maps that cost stamina which drop fairies and affection items. Getting 3-stars will give you 1 ruby once. Clearing the 5th, 15th, 25th, 35th, and 45th maps will increase your unit box by +2 (total: 10). Spend sacred crystals here to receive a buff for the current event. See the event info post for details if applicable. Certain emergency missions have either a star or item trial. Star trials give rewards based on the total number of stars for clearing the emergency mission maps (1-3 per map). Item trials give rewards based on the number of event items you collect after clearing the event maps. Most trial rewards are given during the maintenance after the event is over. See the event info post for details if applicable. Create your teams here. Switch the team you're using by clicking one of the four coloured buttons. Synthesise units to gain xp, cost-reductions, and skill levels here. Units in a team, or locked, cannot be fed to another unit. If you feed a unit, you gain xp based on the rarity, gender, experience level, and the class of the food unit. Each level past LV1 adds additional xp to the base value, i.e. a LV39 Bronze Soldier Hector gives 260xp (38n+70), a AW1 Gold Healer Iris gives 250xp (0n+250), and a AW2 Gold Healer Iris gives 300 (1n+250). In addition, you can feed a fairy with the 'EXP Boost' skill to increase the amount of xp by a certain multiplier based whether it matches the rarity of the unit it's being fed to. For example, a Silver Fairy fed to a Silver Healer Dolka gives a 2x multiplier, but a Bronze Fairy fed to a Platinum Rogue Cypria gives a 1.5x multiplier. *Veteran Teacher Ability (Hashim, Yojirou, etc.) gives same class bonus to all classes. If you feed the same unit to each other, you have a chance of gaining a cost-reduction. It doesn't matter if the units are class-changed or awakened. For example, you can feed an Assassin Betty to a Rogue Betty for a chance of a cost-reduction. Units at mincost will have "限界値” (Minimum Value) next to the unit's deployment cost in their stat screen. Feeding a Time Fairy has a 100% chance of a cost-reduction. See the Random Percentages Section for more details. If you feed a unit that has the exact same skill, you have a chance of gaining a skill-up. For example, you can feed a unit with "Strengthen Attack I" to a unit that also has "Strengthen Attack I" for a skill-up, but a unit with "Strengthen Attack I" cannot skill-up a unit with "Strengthen Attack II". If a unit class-changes and gains a different skill, then they lose all skill levels from their previous skill. 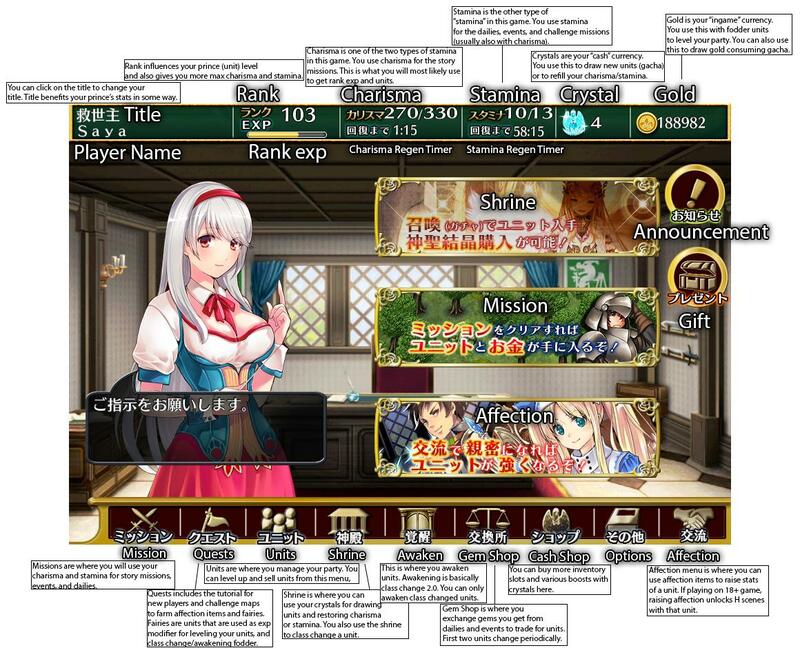 For example, a Gold Healer Iris gains "Strengthen Recovery II" upon class-changing into a Priestess and loses all skill levels she had from "Strengthen Recovery I" as a Healer, whereas a Gold Rogue Betty keeps all skill levels upon class-changing into an Assassin because it shares the same "Assassinate I" skill she had as a Rogue. Finally, you can feed a single Rainbow Fairy to a class-changed or awakened unit for an increased chance of a skill-up. See the Random Percentages Section for more details. Premium Summoning Chance-up Units have a higher for chance* of being summoned than their peers. For example, if there are 15 black units, then you have a 1/3 chance that it's going to be the chance-up black unit if you successfully roll a 3% for a black unit. 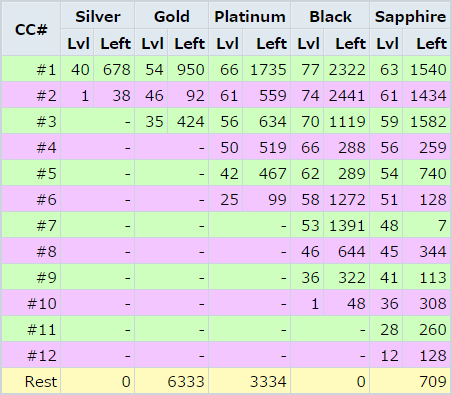 *Black=7x; Platinum=6x; Gold=5x. Rare Summoning is for when you want a higher chance of getting silver and gold rarity units. It's not recommended if you want platinum or black rarity. 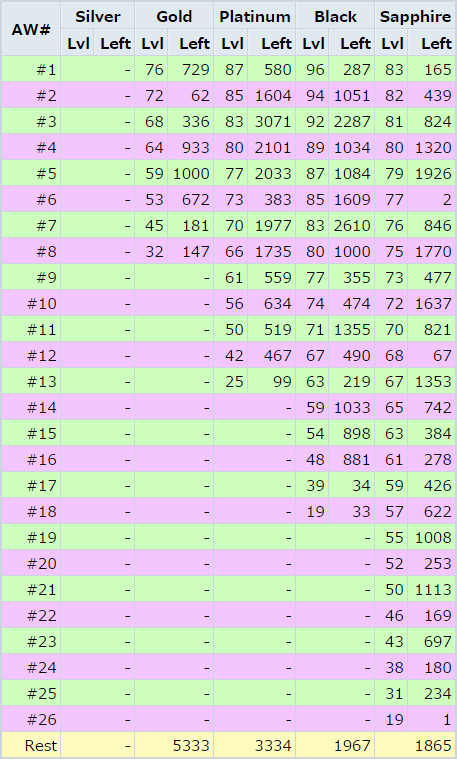 *This data is tentative and based wholly on user collected data (25,000 draws for base summoning, which didn't successfully summon a black unit, but it's possible). The actual percentages are unknown, so use this information with care. *Magic Crystals can be obtained on the Thursday and Friday daily mission maps, and as drops during events, subjugation mission rewards, and log-in bonuses. Revival Crystals can only be obtained on the Saturday/Sunday daily mission maps during a Star/Item Trial Revival event. Spend 刻水晶 (Revival Crystals) for revival event units. 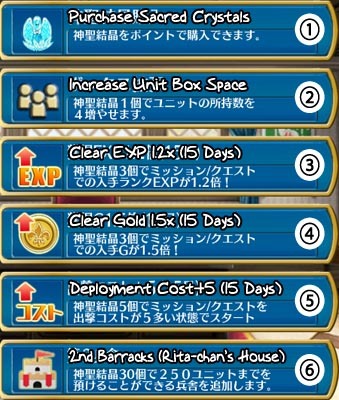 If you already possess a revival unit in your unit box (non-CC; CC; or AW), then the revival crystal cost is reduced. Time Fairies are a one time trade per Dragon Princess's Revival event and do not have a cost reduction. See the event info post for details if applicable. 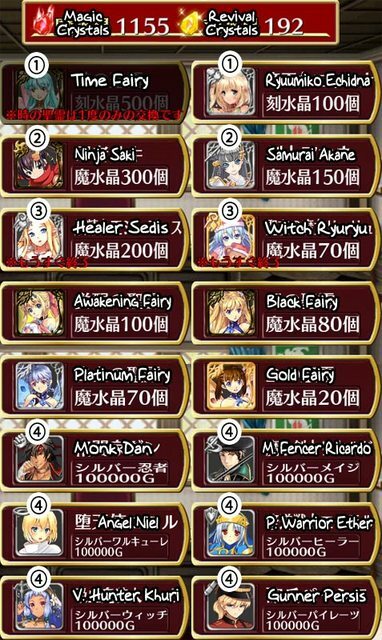 Spend 魔水晶 (Magic Crystals) to trade for the Black Ninja Saki and the Platinum Samurai Akane. Currently unknown whether or not these two will expire in the future. 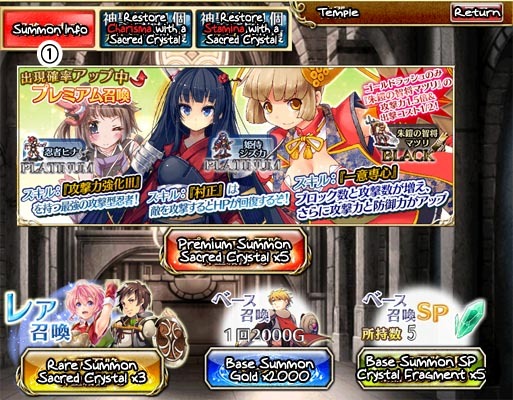 Spend 魔水晶 (Magic Crystals) to trade for certain platinum and gold units that are available for a period of time before being switched out for different units. Unique gold units that can't be summoned include the Gold Ninja Hien, the Gold Avenger Zaram, and the Gold Witch Ryuryu. Non-unique gold units include the Gold Mage Cyrus and the Gold Samurai Kojuurou. See the event info post for details if applicable. 3 Crystals: 1.2x Rank EXP When You Clear Missions/Quests for 15 Days. 5 Crystals: +5 Extra Deployment Points For Missions/Quests For 15 Days. 30 Crystals: 250 Box Space. Requires all 35 Unit Box Expansions and a Rank 50+ Prince to purchase. 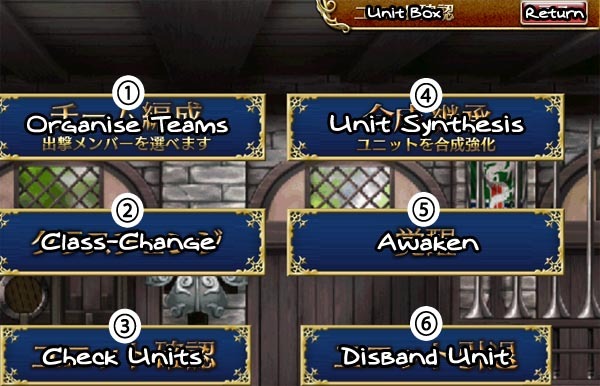 In the Unit menu, bottom-left menu transfers units to 2nd barracks, and bottom-right menu draws units from the 2nd barracks to your unit box. Tip: you can hold left click to view the stats of units in the 2nd barracks. Once you reach 100% affection/confidence, you will gain a 1.2x bonus to the strengthened stats (i.e. instead of 100HP, you will gain 120HP). 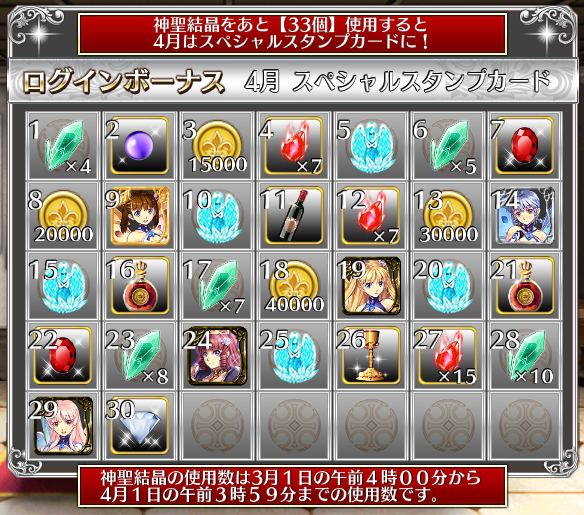 Log-in Bonus, Campaign, and Event Rewards are stored in here. You can hold up to 100 individual presents in here with no expiration date. Maintenance reports and upcoming information are saved here. 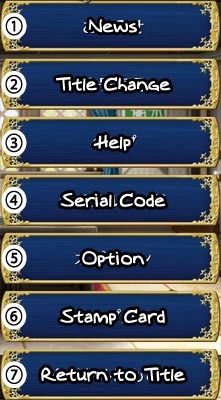 Allows you to change your Prince Title. New titles are available upon reaching specific rank levels. Titles are split into four categories: Skill, HP, AT, and DF. The Prince's Skill raises the AT and DF of all units (Including Prince) so long as the Prince is deployed on the map. If you have the Black Parliamentary Secretary Anna, she'll grant the Prince an additional effect based on his title just by being a team member: 10%MR (Skill), Regeneration (HP), Magic-type Attack (AT), 2-Block (DF). Enter in Serial Codes here. Allows you to turn the Sound Effects and Background Music on or off. 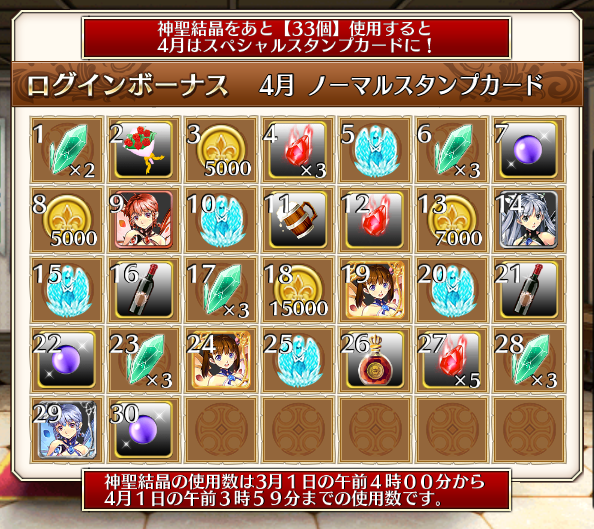 Displays the log-in bonuses for the current month. All bonuses are sent to the Present box. All sacred crystals spent in the current month will go toward unlocking a special or deluxe card for the following month. You can view the number of crystals you need to spend every month to unlock the special or deluxe stamp cards for the following month by looking at the top of your stamp card. 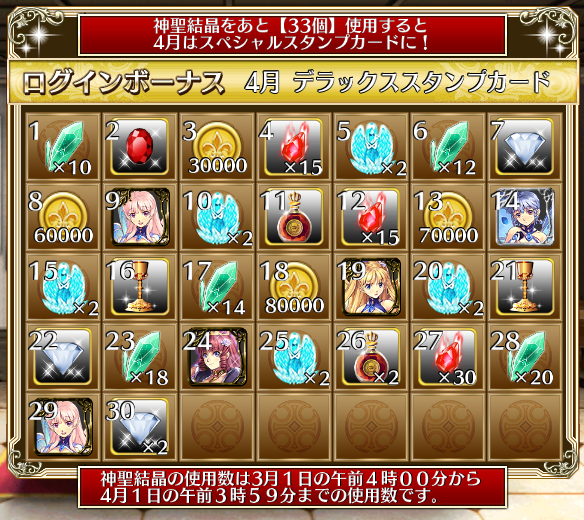 Crystals spent and Stamp Grade will be reset on the 1st of each month, and nothing will be carried over. Returns you to the title screen. Note: Silver-Black is 8x EXP bonus, and Sapphire is 3.375x EXP bonus. AS: Attack Speed; WT: Skill Warm-up Time; CT: Skill Cool-down Time; 'CT: None' (Can Only Use Skill Once Per Battle). Last edited by Petite Soeur; 04-23-2016 at 08:26 AM. You can copy-paste this into a post here, and then click preview, and the board will display it properly until you make the mistake of posting it. 3 out of 1 members found this post helpful. Last edited by Petite Soeur; 06-16-2016 at 05:38 AM. It wonÂ´t start for me... not sure why. Maybe the chrome extension isnÂ´t a valid replacement for a VPN here. Same goes here, look like KC3 must be disabled or uninstall, then using VPN to access it. Damnit. Was really interested, but if i have to deal with VPNs and such its a pass for me. You could always use Firefox to access it.... just saying. 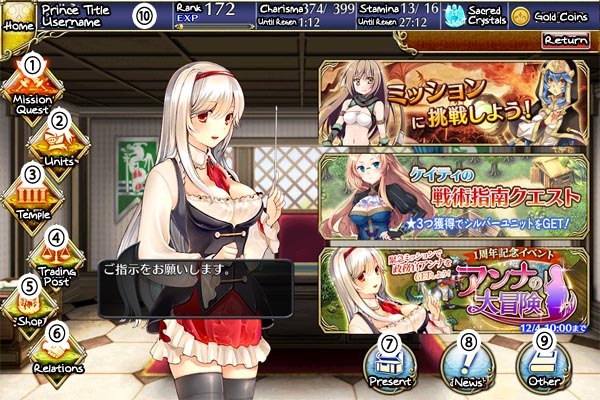 Despite I am a pervert and nothing to do, I am forced to pass this game since it is not suitable for work or at house. Actually nevermind, suddenly it worked. Maybe the server was full or something.